So, without further ado, here are your questions, and our answers. Q: What is the impact to capacity from deploying IoT and its overhead channels on a broadband LTE network? This question applies more to in-band deployment scenarios, where NB-IoT is utilizing resource blocks within an LTE carrier. The NB-IoT carrier is a self-contained network element that uses a single physical resource block (PRB). If there is no IoT traffic, a PRB available for an NB-IoT carrier may be used instead for other purposes, as the infrastructure and spectrum usage of LTE and NB-IoT are fully integrated. The base station scheduler multiplexes NB-IoT and LTE traffic onto the same spectrum, which minimizes the total cost of operation for machine-type communication (MTC), which essentially scales with the volume of MTC traffic. Multiple techniques have been implemented as part of release 13 to insure there is no capacity impact to LTE other than when NB-IOT traffic is being served. Fewer channels and signals are used in NB-IoT than LTE. Also, if the NB-IoT cells are properly optimized, the noise/interference effect generated for the adjacent cells and PRBs will be minimal, which can also impact overall network capacity. Q: By adding NB-IoT to the eNB, will that impact the power budget of the existing eNB? A power amplifier is a shared resource, so of course if there are multiple PRBs used for LTE then in that case that power is not used by the eNB for other LTE services. Also, the power boost feature will use some power, but in a well-optimized network with minimal inter PRB and intercell interference, power control should limit any capacity impact. Q: Am I able to demodulate a master information block (MIB ) over the air (OTA) with CellAdvisor? VIAVI CellAdvisor™ can demodulate OTA information to provide you detailed signal quality analysis, including subframe information for different control and sync NB- channels. Yet decoding MIB and SIB (System Information Block) 1/2 messages with CellAdvisor is only possible through RF over Fiber when testing on CPRI links. Q: What IoT technologies are supported by VIAVI test equipment? Is LoRa the most deployed IoT network? Currently we support 3GPP standard NB-IoT analysis on CellAdvisor. In the future we plan to support CAT-M1 (AKA LTE-M). LoRa and Sigfox are unlicensed spectrum IoT technologies that have been in commercial use for a longer time; however, they offer a separate set of challenges, which is driving more IoT type services towards licensed IoT technologies. Q: Correct me if I am wrong but this is oriented to NB-IoT devices more than network validation features, so does the concept of EVM apply as a quality measurement from the network perspective? Correct, we were talking from a network perspective. Network and devices both need to be validated, and VIAVI CellAdvisor is a very useful solution to validate the performance and operation of NB-IoT/LTE networks. 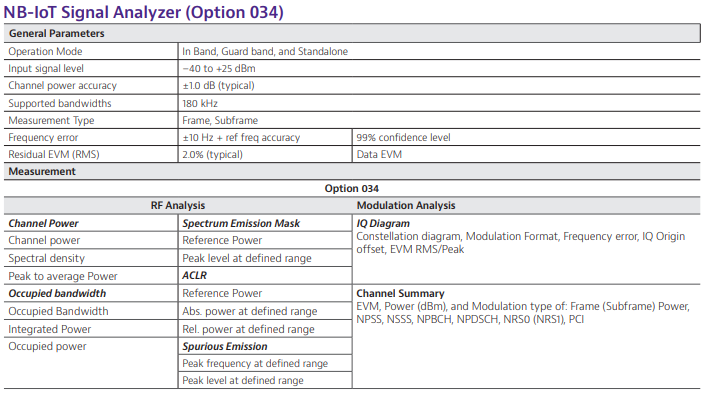 The 3GPP standards also specify minimum acceptable EVM values for several network control channels. Q: Are the NB-IoT measurements part of the general LTE module software or do we need an NB-IoT software option? Q: Is there a new device class defined in 36.101 for Cat-M1 and NB-IoT devices? To minimize the impact of connectivity on device battery life, there are two power class options that can be used for Cat-M1 and NB-IoT devices. One is traditional mobile LTE device on 23dBm (Power Class 3) and a new, less power-hungry one at 20dBm (Power Class 5). The latest 3GPP Release 14 adds an even less power-hungry class at 14dBm (Power Class 6). Q: Can we implement in-band NB-IoT overlaid on existing 3-sector sites with acceptable interference levels? Assuming a correct level of network optimization, you may expect some reduced level of interference between the different sectors, just like what would be the case with the standard LTE signal, where the general assumption is that you may be transmitting a different PCI (Physical Cell ID) from each of the 3 sectors using the same LTE carrier. For in-band NB-IoT specifically, the main point would be to understand the levels of Inter-PRB interference or interference between two different PRB’s that may originate from each sector, particularly if using the same PRB index (or any adjacent ones) for each of the 3 different NB-IoT signals. Q: Will NB-IoT be supported in TDD as well or only in FDD? Also, can delay-sensitive applications can be supported in NB-IoT? Both 3GPP IoT standards NB-IoT and CAT-M can operate duplex modes based on HD-FDD. There is also a possibility for CAT-M to operate in TDD, however support for NB-IoT in TDD mode is still under discussion. Regarding the use of NB-IoT for delay-sensitive applications, this would depend on the specific latency requirements that need to be supported. NB-IoT by design is not meant to offer millisecond latencies to simplify chipset costs and enhance battery autonomy. If your application is delay sensitive and requires latencies e.g. in the range of few milliseconds, you may want to consider LTE-CAT M1 as an alternative. 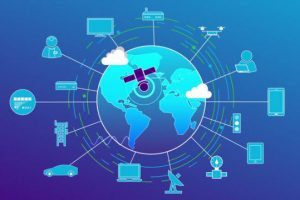 Learn more about narrowband IoT testing on our NB-IoT solution page.